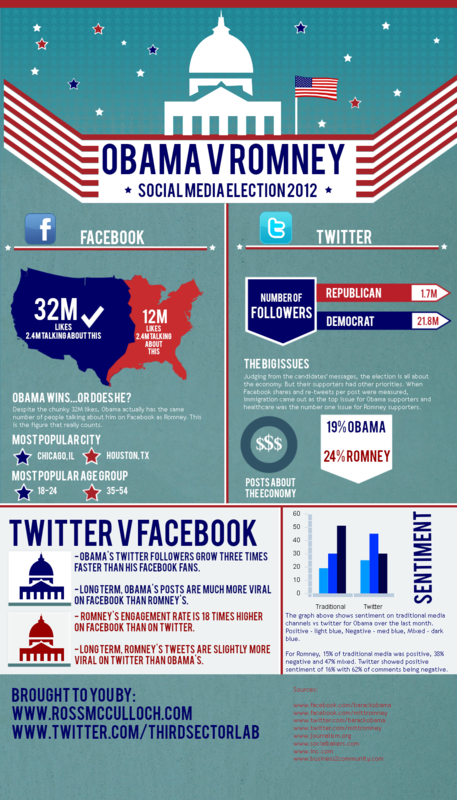 Social media will play a key role in the outcome of the 2012 US Presidential Election. Who will come out on top – Mitt Romney or Barack Obama? Our infographic highlights the key stats from the campaign, showing who wins the major social media battle grounds. You might be surprised! Feel free to download our infographic for your blog or Facebook page folks. If you’ve been following this blog you’re probably a little dissapointed at the level of activity recently. I’ve not posted here in a while because I’ve started using rossmcculloch.com for my personal thoughts, I’ve been busy organising Be Good Be Social and, most importantly, I’ve been taking on a lot of new client work. The Third Sector Lab site you’re on right now is undergoing a complete rethink. We need to share some of the great work we’ve completed recently for clients like Tramway Theatre, ENABLE Scotland, Adrian Ashton, Think! and Relationships Scotland. We also need to let people know what digital media services we offer and what makes us different. So…for just now you can get in touch with me via @ThirdSectorLab or email me ross[@]thirdsectorlab.co.uk if you’ve got any questions about what we do or if you’d like to discuss potential projects. A shiny new Third Sector Lab website will be revealed soon. Chad Norman provides 50 easy-peasy tactics which will help your charity meet the objectives of its social media strategy. If you’ve not got yourself a social media strategy have a peek at Amy Sample Ward’s advice. John Carnell hosts an insightful interview with Marc Bowker of Scottish charity Quarriers. If you take one piece of advice from Marc it has to be: “Donâ€™t flood Twitter with your â€˜corporateâ€™ messages, but instead be human about what you say”. Stop shouting at people! I had no idea who hosted ‘The Price is Right’ in the States, apparently it isn’t Bruce Forsyth. I now know who said host is since Beth Kanter pointed out he’s pledged a staggering $1million if he reaches one million twitter followers by 2010. Claire Rollinson of NCVO provides a brilliant look at Chris Anderson’s and Chris Brogan’s ideas on building online trust. Do you know this Mo Bro who was on Top Gear? OK, so this blog post doesn’t really full under the ‘useful’ category but it’s November Movember so it would be rude not to include it. Have I missed out a mind-bogglingly useful article which you’re read during November? If so leave some linkage in the comments, feel free to shamelessly plug your own blog. I’ve not posted on here for almost a month as most of my spare time has been taken up organising Glasgow Twestival Local 2009. All the hours the volunteer team have ploughed in to planning the event are definitely going to be worthwhile. If you have plans for 10th September 2009 scrap them now. Whatever they are they’ll be dull compared to the Glasgow Twestival. No, really they will. We’re hoping to raise Â£2500 for asthma charity No Strings Attached Scotland by bringing together Glasgow’s twitterati for a night full of amazingly talented local bands and DJs as well as the chance to win a serious stack of prizes. The evening will be hosted by Clyde 1’s twitter-fanatic Colin Kelly and tickets are selling fast. We even got a little mention on the 4th plinth last night (go to 40m40s in). Psss…Enter the promo code ‘thirdsectorlab’ and you can get your ticket for just Â£7 instead of the standard Â£10! The full title of Marta Kagan’s presentation (below) is actually ‘What the f*ck is social media? One Year Later’. However that doesnt make for nearly as snappy a post-title. If you work for a business or non-profit who currently think social media is a waste of time you need to show them this. Marta’s follow up to the original ‘What the f*ck is social media’ will help you understand the big why and how questions. As Marta declares…Social media playtime is over! PS…I’d love to know which stat from the presentation really stuck in your mind. Comment away! A couple of weeks ago I asked my readers to come up with twitter-related questions for James Paterson, Digital Communications Manager at O2. James hasn’t had time to answer them all butÂ below you’ll find some great insights in to how a corporate giant engages with people on a personal levelÂ via social media. So are O2 getting their social media strategy right? Q1 Dan Donald @hereinthehive: I can only assume that you guys get swamped through channels like Twitter. How do you handle these in-house? Filtering software such as Tweetdeck? How many members of staff are on â€˜social channelâ€™ duty, Twitter inÂ particular? Q2 Richard Baker @richard_baker:Â How does your role link to other teams in the business eg customer service etc and how do you encourage leaders to listen and respond toÂ feedback? James:Â We are supported by a handful of dedicated customer service advisors who help us to respond to the customer-related questions we get asked. Sharing feedback we receive from all our social media presences is essential and is one of the main reasons we invest so much time and energy into the online space. Weâ€™re lucky in that the majority of people at O2 understand the value in channels like Twitter already. We have a young and vibrant set of people who use social media in their personal lives already. Itâ€™s just as well, because we rely on different business areas to help us respond to feedback, and in return, they rely on us to understand what is being said about the things that concern us, like phones, network coverage and pricing. This extends all the way up to board level â€“ our directors often stop by my desk to ask what is being said on Twitter! Q3 MJ Ray: Youâ€™re on twitter, but are you on any OpenMicroBlogging site? If not, why not? Itâ€™s the GSM ofÂ microblogs. James:Â Weâ€™re currently exploring a range of different social media tools to make sure we reach as wide an audience as possible. We are always careful to walk before we can run and have a commitment to sustain any channel we set up and use it with credibility. Thanks for the tip â€“ weâ€™ll explore that one too. James:Â Definitely both. Itâ€™s great to see how many O2 customers contact us to say theyâ€™re glad weâ€™re on a particular social network â€“ itâ€™s equally important to hear feedback from existing customers if thereâ€™s something they want us to change or feedback. One of my favourite tweets was from someone who decided to choose us as their operator because we were on Twitter â€“ it proves that listening and taking part in discussions has real merit. And yes, from a brand perspective we think it can only be a good thing. Our mantra is to be open and trusted as a brand, and Twitter helps us do this. Q5 Stephanie @sdoca08:How do you manage to Twitter about O2 without always having a link back to a web page? Do you have any guidelines for internal staff about using social media? James:Â Thatâ€™s simple â€“ because for us itâ€™s a communications channel and not a marketing channel! Where it is beneficial, we will link to our news sites or other channels to show pictures or video, but our Twitter feed isnâ€™t about linking to the O2 Shop. We do have guidelines for our staff on social media. We developed this by holding internal focus groups with staff and then developing a policy that helps shape the way people use these tools in a work capacity, whilst still giving them freedom that all-important freedom. Rather than insert an image of the test card while I wait for James to respond to everyone’s wonderful social media questions here’s the story (so far) of twitter. Infoshots came up with the original design concept, which was tweaked slightly by Manolith. Start at the roots of the tree and work your way up. Jankis Krums gets a look in but the rest of the twitter family tree looks decidedly celebrity orientated. Is that really all twitter is about? What defining moment would feature on your story (so far) of twitter? TheyÂ employ over 11,000 people in the UK,Â operate 450 retail stores and sponsor the country’s biggest music venue. If there’s one word to describe o2 it is HUGE. Despite their size the telecommunications behemothÂ is one of the few major corporationsÂ trulyÂ engaging withÂ their customers via the medium of social media.Â I’ve been particularly impressed at how quickly and efficiently they deal with customer queries on twitter. Is this openness having a positive effect on customer satisfaction and increasing business for o2? Well now you can find out as James Paterson, Digital Communication Manager at o2, has agreed to do a twinterview, taking all the questions for the twittersphere. Same concept as myÂ twinterview with Janis Krums.Â If you’ve got something you’d like to ask James please leaveÂ your question as aÂ comment on this post. We’ll have the full interview up next week. Closing date for questions is Friday 19th June at 5.00pm (BST). On Friday night I attended the wonderful Digital Britain Unconference Scotland organised by Craig McGill. Twenty three people crammed into a private area of The Living Room, Glasgow, to discuss the future of the internet in Scotland. Some pretty interesting topics were covered, from broadband access across rural areas to the proliferation of social media. Sarah Drummond gives a great summary of the main points on her blog. This conveniently allows me to be rather lazy and not write too much on a Sunday afternoon. I also stole the photograph above from her blog too, making me doubly lazily. Andy Bright has posted a very interesting post-unconference video on his blog, discussing disconnection and disparity within the Scottish digital community. I’m particularly interested in his idea of aggregating all of the information spilling out of existing online communities into one hub. This could save an enormous amount of time, save duplication and ultimately be cost-effective. So what do others think, is the hub concept proposed by Andy the way forward?